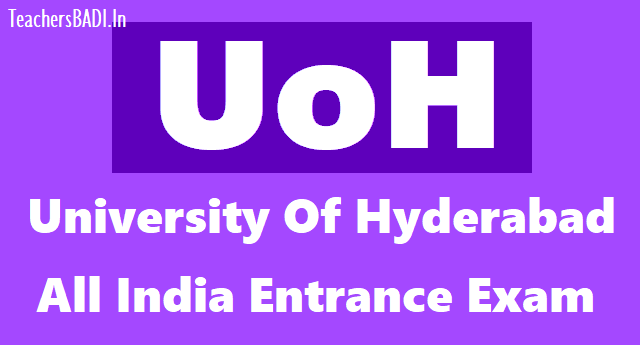 HCU Entrance Exam Hall tickets 2019, UoH Entrance Exam Hall tickets 2019, University of Hyderabad Entrance Exam Hall tickets 2019, Hyderabad Central University Entrance Exam Hall tickets 2019. University of Hyderabad - All India Entrance Exam 2019: University of Hyderabad invites applications for admission to various 5 Year Integrated PG, PG, M.Tech, M.Phil. courses and Ph.D. programmes through an All-India entrance examination. The University of Hyderabad (UoH) will start accepting applications for its admission entrance test from April 1, stated a notification issued on March 30. According to the notification, aspirants seeking admission into post-graduate, master of technology, philosophy and PhD programmes have to appear for an all-India entrance test which will be held from May 27 to May 31, 2019. The last date for submission of online applications is May 3 following which hall tickets will be issued on May 20. From the academic year 2019-20, the UoH has introduced new post-graduate, doctoral and integrated MSc/PhD programmes thereby increasing the annual intake from 1,900 to 2,140. Applied Geology, Sanskrit Studies, Microelectronics and VLSI design have been approved for post-graduate programmes. For PhD, the university has introduced electronics science and engineering and systems, computational biology, Hindi and anthropology. Besides this, an integrated master of science and PhD programme in animal biology and biotechnology have also been added to the list of new programmes. The varsity has also resumed admissions for few courses such as master of technology in nanoscience and technology, master of philosophy in anthropology and regional studies. The new courses were recently approved during the 84th academic council meeting held on March 22. 2. Postgraduate Courses: M.Sc., M.C.A. M.B.A., M.A., M.P.A., M.F.A, MPH, M.Ed., PG Diploma, M.Tech. Submission of online applications: 01.04.2019. How to apply: Apply online through University website. Online Application for Admission to the courses offered in 2019 batch..
1. Read the admission notification and Prospectus-2019, the eligibility criteria and availability of Seats Category-wise thoroughly before filling the application form. 2. Keep all the information ready before starting to fill the Application Form. 3. Keep ready the scanned (digital) images of your Photograph, Signature and Caste Certificate (if applicable). 4. OBC candidate has to upload caste certificate as per the GoI format. (State BC certificate will not be considered as proof of OBC) Applications submitted under OBC category without a valid OBC certificate will be rejected and no further correspondence will be entertained. 5. Please note your Application Number for future reference. 6. Incomplete application form will be rejected. 7. Application form will be considered complete only on receipt of the prescribed fees. 8. Fees once paid will not be refunded under any circumstances. Important Information: Hall Tickets, information to short-listed candidates for interview and selected/wait-listed candidates will only be notified in website. It is the responsibility of the candidates to check the University website for downloading the Hall Tickets, results and the relevant formats required for admission.